Edgar Allen Poe and especially "The House Of Usher" have inspired a lot of artists throughout the years, and this one is easily the best I have heard so far. Very lively field recordings, massive drones set the sonic scenery, held together by orchestral sounds. This soundtrack inspired me to finally read the story, and it is difficult to describe what both in combination did to me. This release is a highlight, absolutely up there (or better) with huge Hollywood or game productions. Never close a book before it's truly finished. I am writing this on New Year's eve 2018 and in just a few hours this place on planet earth will be the next to rotate across that magic imaginary borderline that will make our calendar apps switch to yet another year. On the outside the usual firecrackers are going off in increasingly shorter intervals, reverbating from the hillsides. And fool I was to think this morning I could now safely close my musical diary for the year. 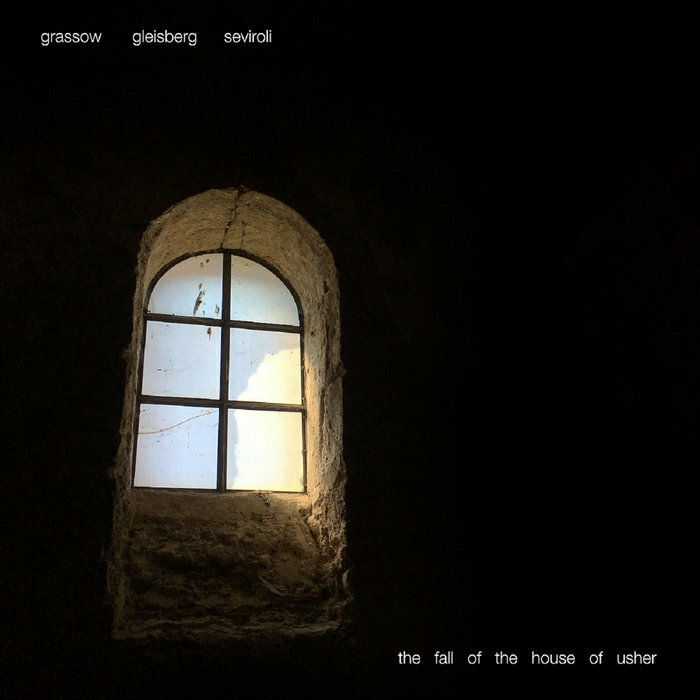 Glasberg - Grassow - Seviroli: Soundtrack to the short story "The Fall Of The House Of Usher by Edgar Allen Poe"
The long awaited successor of the legendary "House on the borderland" line up has finally become reality. It was a concern of all members to set this Edgar Allan Poe short story to music and the result is worthy of a successor to HOB. We're proudly present this album here - ONLY available as download. In short, so close to the year's end this is a truly unexprected surprise, a highlight and accompanying 2018 out on a very, very high note, so to speak. Or, more literally, it's going ot with a bang. From that trio "Glasberg - Grassow - Seviroli", I only know Mathias Grassow who is a drone artist I value a lot. Just days ago he had finished releasing a huge and epic installment of seven albums, one dedicated to each continent, and if you bought all of them you even got an eighth continent as a bonus incentive. Yay. But I am going to write about that later, when I feel ready. Plus I will surely need to do some research upon the other two musicians, Gleisberg and Seviroli, after hearing this that's a duty. But not today. Now let's concentrate on this album, a soundtrack for Edgar Allen Poe's famous short story The Fall Of The House Of Usher. Given especially it's popularity, it has inspired a whole lot of diverse artists throughout the centuries and their works could fill book- and CD shelves. But I daresay this album is by far the best, at least from what I have heard so far. After just a few minutes listening in I retreated, digged up the source text and started listening/reading. A mistake? I am not so sure. It is so very well done that I cannot describe what both works combined did to me. A strange mixture of euphoria and tension. As mentioned, I only know Mathias Grasow and will need to dig up the other artists. But what I do know is that they are an exceptionally awesome team. This soundtrack is a dense and atmospheric mixture of orchestral sounds, nervewrecking but beautifully crafted drones and stunningly lifely field recordings. I am a sucker for field recordings and they are so very well done that when listening on headphones you really have a hard time to distinguish between real life and these recordings. The sonic scenery is remarkably lifely and 3D, I wonder whether they are binaural, the thunder, the rain, the door, the horse and all the other sounds, they all appear so very real. The overall sound design of this release is outstanding and as I am writing this the album is playing for a second time and even though I already knew it, I almost jumped when a door closed a few minutes into the album. It did not slam, it actually closed quite slowly, but it sounds so real as if it was directly in front of me. And those drone sounds ... just goosebumps. And all this is tied together by orchestral sounds. I have heard a lot of soundtracks so far, but this one his very high up there with the best hollywood or game productions. I am very impressed, this very well is yet another highlight of 2018. Though, just totally unexpected so close to ... "the end". I am not able to distinguish what I love most about this: the orchestral sounds, the synth drones or the field recordings. This album is an amalgam of remarkable musicianship and I really feel how much work and dedication went into this. And with the last thunder from this album ringing out I do not want to listen to any more music for this year. He was totally a true artist. Rich people should go out and support their local artists, but they are too snobby. They have to buy things that are at least a thousand miles away and selected by a curator. @Waitman Gobble This is so true and this is why I say: Buy that album! You will support three musicians who are far from having big money and production budgets but gift us with a soundtrack that is IMO totally big and awesome. While Edgar is no longer with us they are just loving music and I'd be happy if the album would find as many loving ears as possible. Rich people should go out and support their local artists, but they are too snobby. They have to buy things that are at least a thousand miles away and selected by a curator.